Russia's Baltic Fleet makes 18,000 mile voyage. View larger image. 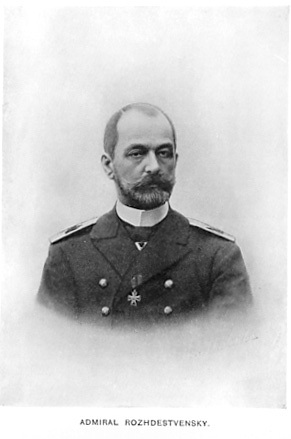 Vice-Admiral Zinovy Petrovich Rozhlestvenskii. Harper's Weekly. View larger image. Part of the Russian Baltic fleet. Harper's Weekly. View larger image. 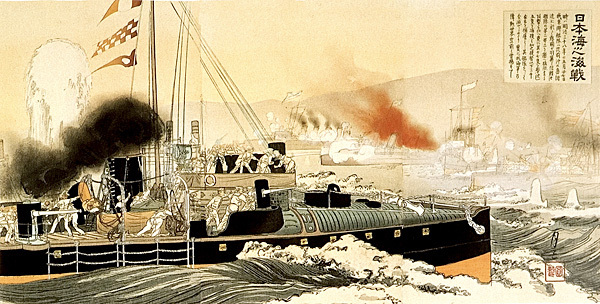 Japanese torpedo boats attack the Russian fleet at Tsushima in this block print. View larger image. The victorious Japanese are glorified in these prints which also show their superior skill in making and using such sophisticated machines as speedy torpedo boats. Click picture to see larger image. 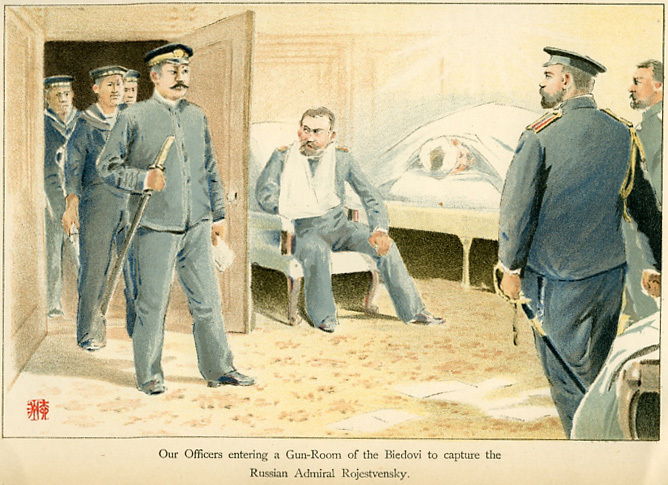 Vice-admiral Rozhlestvenskii is captured on his vessel by the Japanese. View larger image. Route of Russia's Baltic Fleet through Tsushima Straits. View larger image. Russia was making an effort to re-supply its forces by rail but the Trans-Siberian Railroad was only a single track, making troop movements difficult. 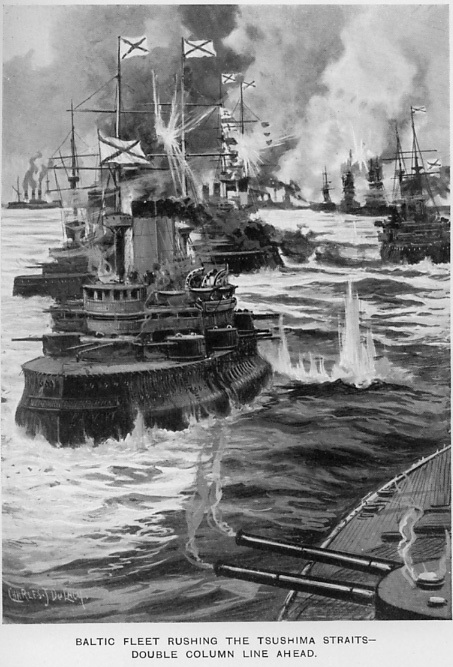 During the siege of Port Arthur, Russia pinned its hopes for victory on its large, though poorly equipped and trained, Baltic fleet that was sent round the world to engage the Japanese. 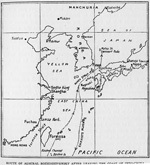 Russia planned to defeat Japan on the seas and cut the island nation off from its army on the mainland. The squadron’s commander, Vice-Admiral Zinovy Petrovich Rozhlestvenskii, knew the ships were in poor condition and the sailors poorly trained, and feared a naval disaster. Reluctantly he and the fleet left the Baltic for an 18,000-mile voyage in early October 1904. By the time the fleet reached the Far East, Port Arthur had fallen so the ships were to continue on to the Russian port of Vladivostok. 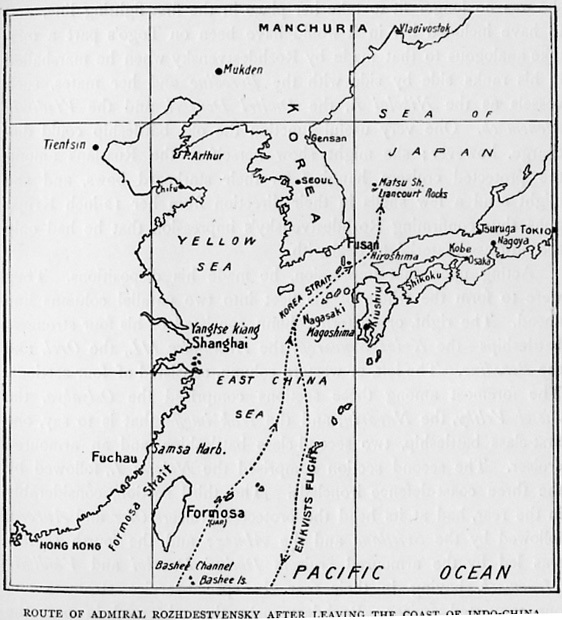 The Russian fleet attempted to reach Vladivostok by way of the narrow Tsushima Straits where the Japanese were waiting for them. View larger image. 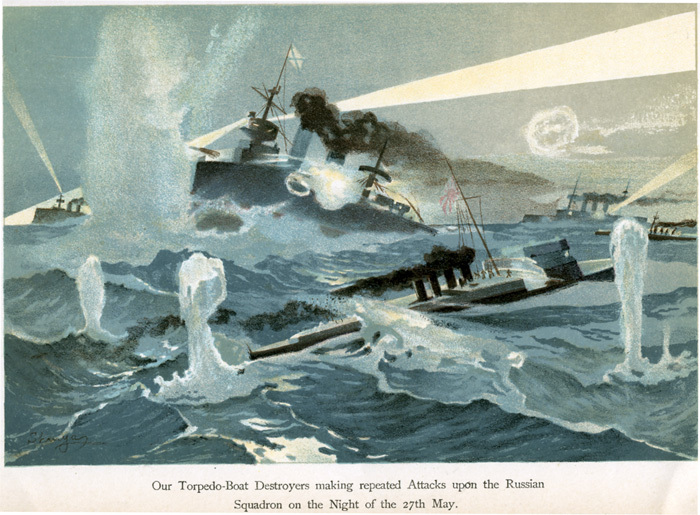 In one of the most shocking naval actions in history, the Russians steamed through the Tsushima Strait between Korea and Japan and on May 27-28, under Admiral Togo, the Japanese fleet picked off the Russians in a classic naval maneuver called "crossing the T." Of the thirty-eight ships in the Russian squadron, only two destroyers and the light cruiser Almaz reached Vladivostok. 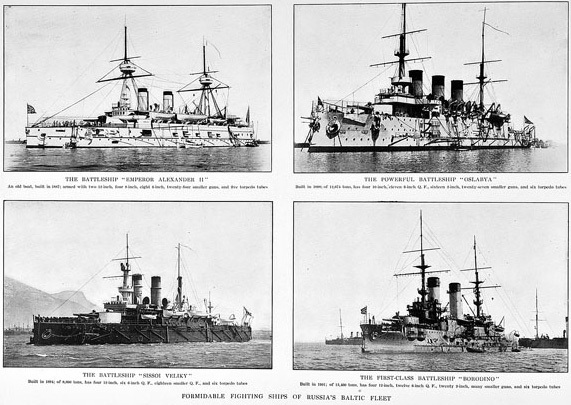 Six other smaller ships reached neutral ports where they were interned. The rest of the fleet was sunk, beached, or surrendered to the Japanese. 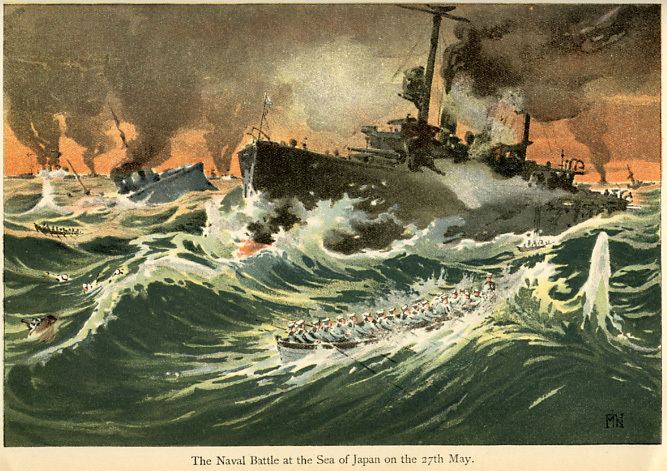 The Japanese only lost three torpedo boats. Japanese casualties were approximately 100 and about 575 wounded, compared to the approximate 5,000 Russians killed. Vice-Admiral Rozhlestvenskii was wounded and captured on his ship by the Japanese. Japanese Admiral Togo became an instant hero in his country. 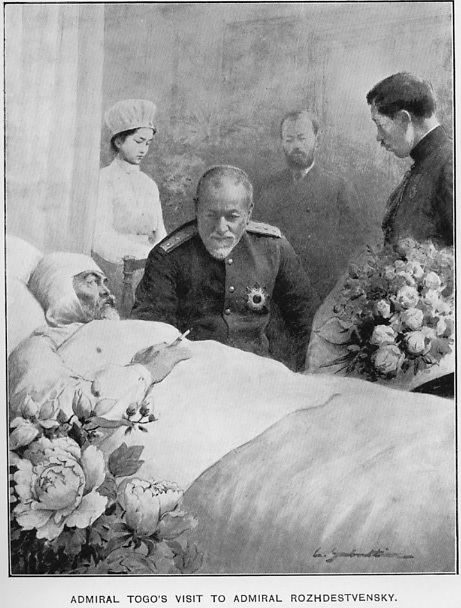 Admiral Togo visits wounded Vice-Admiral Rozhlestvenskii. Harper's Weekly. View larger image.